Harold "Bud" Masters, 90, of Mansfield passed away January 28, 2019 at Kingston of Ashland. Harold was born July 15, 1928 in Columbus, Ohio to Charles and Amy Parker Masters. He served in the United States Navy during World War II and then in the Air Force during the Korean Conflict. 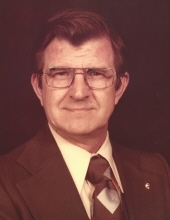 Harold was a Supervisor at the Division of Electricity for the City of Columbus for 32 years. He was a member of St. Peter's Catholic Church, Knights of Columbus 4th Degree, American Legion and VFW. Survivors include his son Walter (Deborah) Masters of Utica; grandsons Nathaniel and Emmett Masters; sister Barbara Serraino. In addition to his parents, he was preceded in death by his wife Helen Kowalski Masters; brothers Ralph Masters and Frank Masters; sister Jo Rogers. Friends may call at Herlihy-Chambers Funeral Home, 173 Park Avenue West, on Friday from 5 - 8pm with a vigil prayer service at 7:30pm. A Mass of Christian Burial will be celebrated 9:30am Saturday at St. Peter's Catholic Church with Rev. Gregory Hite officiating. Burial will follow in Mansfield Catholic Cemetery. In lieu of flowers, memorial contributions may be made to Knights of Columbus #687. To send flowers or a remembrance gift to the family of Harold "Bud" Masters, please visit our Tribute Store. "Email Address" would like to share the life celebration of Harold "Bud" Masters. Click on the "link" to go to share a favorite memory or leave a condolence message for the family.